Maid explores the underbelly of upper-middle class America and the reality of what it's like to be in service to them. "I'd become a nameless ghost," Land writes about her relationship with her clients, many of whom do not know her from any other cleaner, but who she learns plenty about. As she begins to discover more about her clients' lives-their sadness and love, too-she begins to find hope in her own path. Searing in its emotional honesty, Womanish is an essay collection that explores what it means to be a black woman in today’s turbulent times. Writing with candor, wit and vulnerability on topics including dating after divorce, depression, parenting older children, the Obama’s, and the often fraught relations between white and black women, McLarin unveils herself at the crossroads of being black, female and middle-aged, and, ultimately, American. Morrison's newest collection is divided into three parts. The first is introduced by a powerful prayer for the dead of 9/11; the second by a searching meditation on Martin Luther King, Jr. and the last by a heart wrenching eulogy for James Baldin. Brown White Black is a portrait of Nishta J. Mehra's family: her wife, who is white; her adopted child, Shiv, who is black; and their experiences dealing with America's rigid ideas of race, gender, and sexuality. For years Journalist Marianne Power lined her bookshelves with dog-eared copies of definitive guides on how to live your best life, dipping in and out of self-help books when she needed them most. Then, one day, she woke up to find that the life she hoped for and the life she was living were worlds apart—and she set out to make some big changes. She vowed to test a book a month for one year, following its advice to the letter, taking what she hoped would be the surest path to a flawless new her. But as the months passed and Marianne’s reality was turned upside down, she found herself confronted with a different question: Self-help can change your life, but is it for the better? 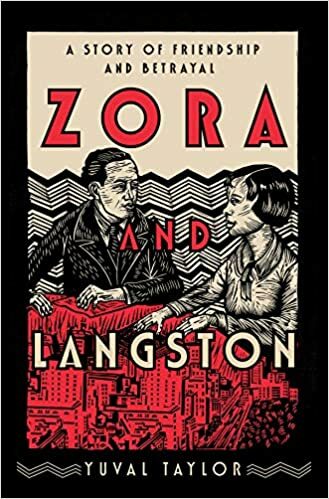 Zora Neale Hurston and Langston Hughes first met in 1925, at a great gathering of black and white literati, and they fascinated each other. They traveled together in Hurston’s dilapidated car through the rural South collecting folklore, worked on the play Mule Bone, and wrote scores of loving letters. They even had the same patron: Charlotte Osgood Mason, a wealthy white woman who insisted on being called “Godmother.” Paying them lavishly while trying to control their work, Mason may have been the spark for their bitter and passionate falling-out. Was the split inevitable when Hughes decided to be financially independent of his patron? Was Hurston jealous of the young woman employed as their typist? Yuval Taylor answers these questions while illuminating Hurston’s and Hughes’s lives, work, competitiveness, and ambition, uncovering little-known details. All descriptions provided by the publishers.